Happy, happy Friday! Here’s a little floral for the start to your weekend. I wore this look to meetings, showrooms and to the Alice + Olivia Presentation during NYFW. I don’t think I’ve ever received more compliments on a skirt in my life ;) Have a wonderful weekend, xo!! Beautiful skirt! No wonder it gets you lots of compliments. This skirt is so cute! And I love how you styled it with the chambray shirt and gold details. lovely! That floral skirt looks marvelous. Love this skirt!! The volume is amazing! Gorgeous! Love the shape of that skirt! Well no wonder that you got so many compliments! It’s an absolutely perfect skirt! It’s definitely a compliment worthy skirt! Love the look! Love this whole look. 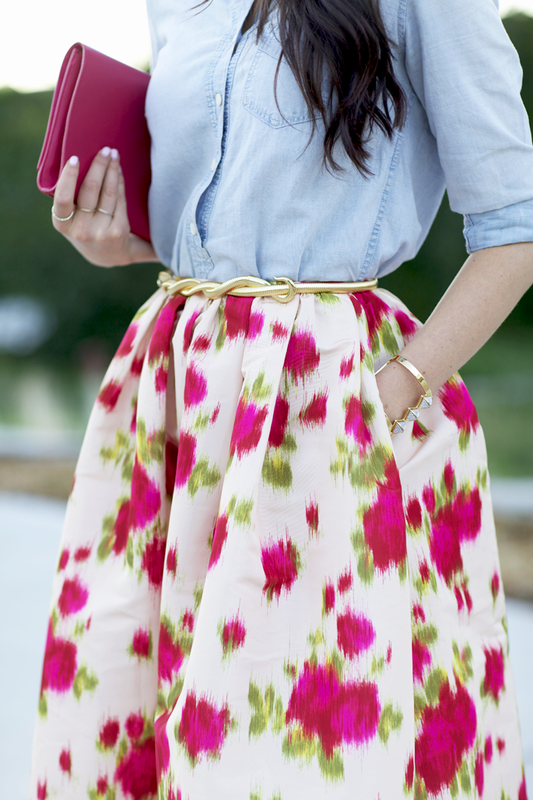 Love how you paired the floral skirt with the chambray shirt. This really makes me want a full skirt now. So pretty! This is such a pretty look, gorgeous!! Beautiful skirt and those shoes are super fab! So ladylike! Love the colors in the skirt! That skirt is amazing! You can pull off anything. Love it. This skirt is beyond gorgeous! The colors are stunning! This skirt is beyond beautiful! I love it! This skirt absolutely stunning. I can see why you got all those compliments. And it’s so beautiful, you can really wear for a long time to come. Have a fabulous weekend! Such a bold color to pick for an everyday clutch like that – but I love the way you incorporate it into your outfits!! Love that full skirt, it would really stands out in the crowd. SUch a pretty skirt. Gorgeous. Love the skirt! So fun! 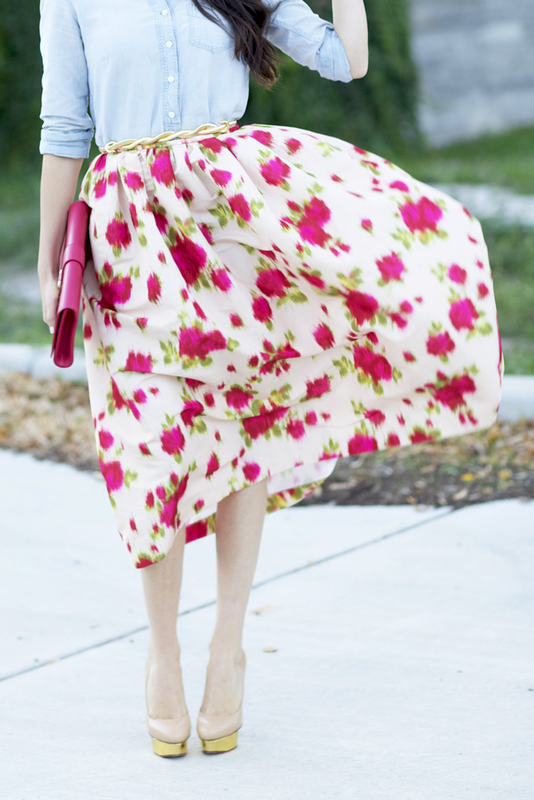 The length of the skirt and floral pattern is so springy, but perfect for Fashion Week! Wow… the skirt looks absolutely stunning! Amazing! That skirt is so beautiful- so feminine yet playful! Love how you paired it with a chambray shirt (my favorite clothing item). Your new clutch and heels are perfection with this look!! amazing skirt! you look lovely! Oh my, how lovely this skirt looks on you!! Amazing! Gorgeous skirt and matching clutch! Yaaa for chambray + Floral !!!!! Also majorly jealous of the c/o YSL bag !!!! Beyond beautiful & it’s on my never ending list of bags I intend to own !!!!! omg that skirt and omg that belt! Beautiful. Love how you toned it down a little with the denim button down. perfect look! love the skirt!! Woow, that skirt made the look! That skirt is totally awesome as are the CO shoes! That skirt is AMAZING! Wow so stunning! Gosh that skirt is simply stunning, you look amazing! What a gorgeous skirt. The print is so uniquely you! It’s like a blossom or a bouquet of flower! This skirt is just plain fabulous in every way! That belt is awesome, and the skirt is beautiful (love the print), but holy crap does it look…voluminous. Probable one of your best looks ever since I discovered your blog!!!! you look lovely in this floral skirt! 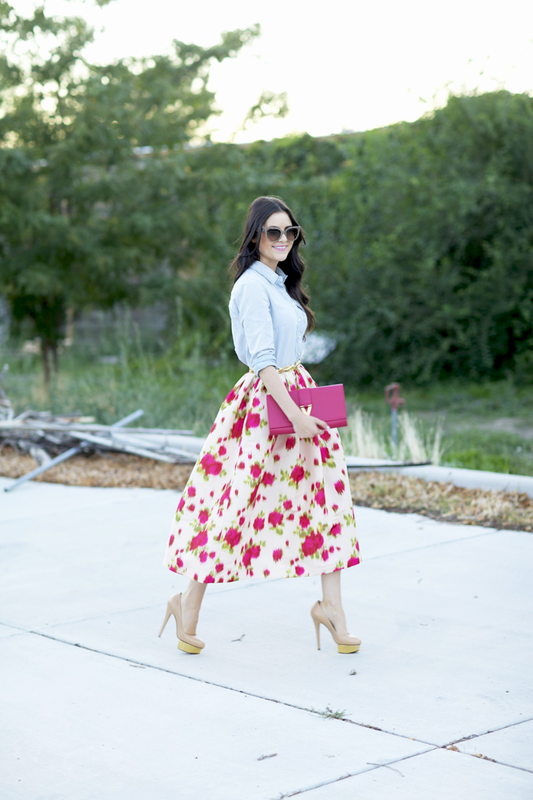 I am in love with Midi skirts…this one is fabulous! such a beautiful pattern! and i’m crazy about that belt!! I adore this outfit and beautiful photos!!! I absolutely loved how you styled that skirt. Katie Holmes recently wore that skirt with the matching top, which looks great but you styled it in such a unique and sophisticated way! Love it. Loving that big full skirt! Wowza!! One of my favorite outfits on you!! Gorgeous! In love with that skirt. you make running a blog look easy. The overall look of your wewbsite is excellent, as smartly as thee content!